For the past century, America has embraced a wealth of customs and advancements from Japan. We buy their cars. We invest in their technology. We even buy their clothes. And of course, we eat their food. Our, lifestyle, intellect and palate have prospered from their culture. And our love affair with Japan is insatiable, especially when it comes to their cuisine. We crave their tempting tempuras, nurturing noodles, spiritual sakes, and therapeutic teas. But above all, we crave their sushi. Sushi is a “hot” or shall we say “raw” commodity that entered the Western scene more than 2 decades ago, drawing the curious from near and far with it’s elegance, sensuality and mystique. What is it about raw fish that causes millions of people to take off their shoes, pull out their platinum cards and expect fresh delicacy? It’s simple…sushi is delicious, it’s fun to eat, excites our experimental and adventurous sides, and is incredibly nutritious. And what woman wouldn’t want to lock eyes with a master sushi chef slicing up his own blend of sushi magic. If you are new to the sushi experience, you may find yourself a bit overwhelmed. 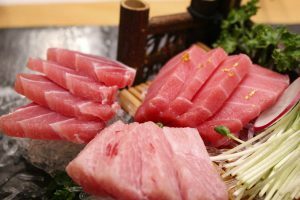 A seemingly endless list of fish, rice, seaweed, and various accompaniments, often sited in Japanese, can make you feel much like a “fish out of water.” Relax… sushi is such a popular delicacy in America as well as throughout the world, that millions of people have managed to successfully navigate the seemingly endless array of choices. With a bit of knowledge about the standard ABC’S, as well as a hands on approach to our own selections, you’d be surprised at how quickly you can become familiar and confident with the menu, perhaps even become an expert. The Japanese culture has tremendous respect for their cuisine, and that includes the fish. Anybody that knows sushi will tell you that the most important factor in a great sushi experience is the freshness and presentation of the fish. We go to great lengths to ensure our fish is as FRESH AS POSSIBLE, having it flown in from Japan over night. Our chefs are skilled at taking great care in inspecting, handling, chilling and preparing it with precision. Try to imagine an Italian kitchen without a bottle of olive oil on the shelf, or a French bistro not offering butter to spread on your hot baguette, or worse, your favorite American diner without ketchup & mustard? The same goes for Japanese cuisine. 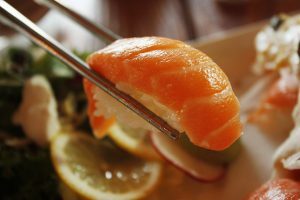 Without the following staples, sushi just wouldn’t be the same…..
Is a short grain rice and has a specific balance of starches that allows it to stick together. This stickiness is necessary for both precisicion in preparation and the ability to be handled delicately with chopsticks. The sushi rice is uniquely seasoned to make it the perfect paring for fish and vegetables. A very complex plant that has been termed “Japanese Mustard”. A pickled ginger that has the pretty, pink hue and a fragrant, tart taste. Is the ketchup of Japanese cuisine and is offered table-side to combine with wasabi. Are uniquely created by our own chefs and artfully displayed on the plate to enhance the components of that particular dish. MAKI really means “roll” a term used for the various types of sushi rolls. 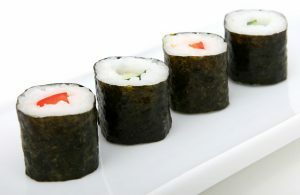 Maki consists of fish, vegetables, rice, and seaweed rolled together and cut into bite-sized pieces. The fish is placed in the middle and either the seaweed or the rice may be the outer layer. 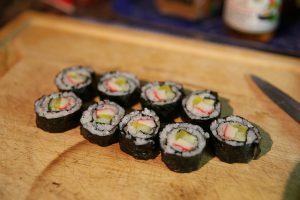 Not all maki is prepared with raw fish, there are cooked seafood and vegetarian options as well. 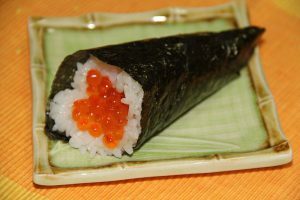 FUTOMAKI kind of means “fat roll” about 3 times the size of maki and usually has a large number of components in the roll. Rather than being sliced into 6 or 8 pieces, it is always sliced into 4. TAMAKI kind of means “tree roll” The difference is that the roll is not cut into pieces. An authentic tamaki roll is wrapped tightly on one side and produces an abundantly overflowing cone of fresh ingredients, similar in shape to a tree. SUSHI NEGIRI really means “naked” The dish consists of a hand-formed bed of rice topped with a thin piece of fish. This dish highlights the essence of it’s color and beautifully simplistic presence.